Moscow, July 28, Interfax - The Russian Orthodox Church marks the Day of Christianization of Rus, the day of memory of Holy Prince Vladimir, on Monday. 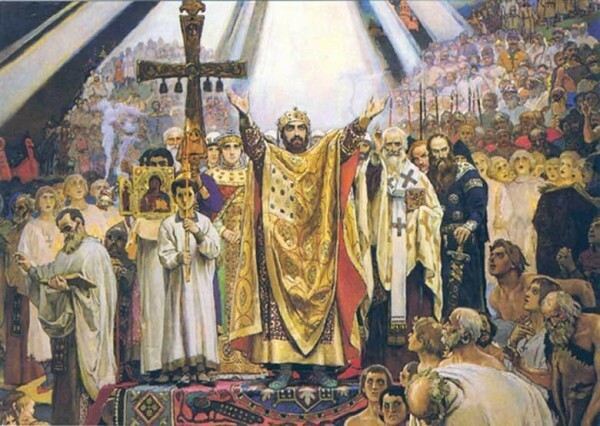 This year will be the first in the past few years when the central celebrations of the Day of Christianization of Kievan Rus will be held in Moscow, not in Kiev. “For several years, Moscow remained only a periphery of the general church celebrations o this day because the patriarch all members of the Holy Synod were in Kiev. This time, the Synod has met in Moscow, and all its Ukrainian members, including the locum of the Kievan Metropolitan See, took part in it,” Archpriest Nikolay Balashov, deputy head of the Synodal Department for External Church Relations, told Interfax-Religion. He said the Day of Christianization of Rus is a big holiday of the entire Russian Orthodox Church. The tradition to celebration the Day of Christianization of Rus in Kiev was started back by Patriarch Alexy II, the predecessor of Patriarch Kirill, back in 2008. Since then, the main celebrations had been held in Kiev every year on July 28. In the meantime, the Ukraine issue remains a central issue in today’s celebration in Moscow. Today, the patriarch and parishioners will pray for peace in Ukraine, the Moscow Patriarchate told reporters.